The latest instalment of the ever expanding Ghost in the shell saga. Kenji Kamiyama, beautifully crafts the next provocative instalment of the ever evolving Ghost in the Shell series. Based on the Manga by Shirom Masmune, and set in the Stand alone complex universe this movie presents the next evolution of this series while still maintaining the key elements which made the original 1995 film son breath-takingly innovative. For anime fans the animation is a CGI treat; 3D and tradition techniques are seamlessly blended. It can be seen how much effort and research the animators have put into developing their near future world. The haunting soundscape created Yoko Kanno, gives a texture to both the world and it its characters which are often missing from eastern and western cinema alike. The film has the pace of a neo-noir political thriller; the progressive unfolding of the drama makes the few action scenes more poignant and rewarding. Like the other Ghost in the Shell incarnations its strength lays in its exploration of ideas: Solid State Society explores the nature and relationship between patriotism and terrorism. 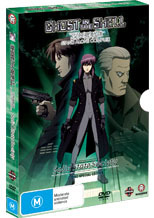 Solid State Society is rewarding for not only ghost in the shell fans but for fans of gritty thrillers as well.